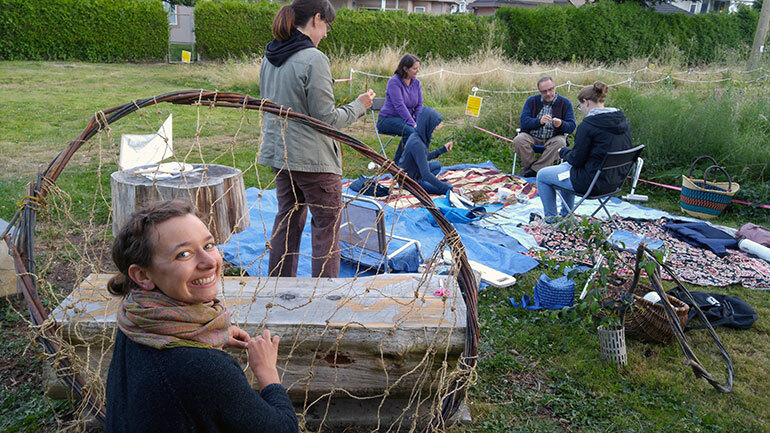 Artist and sculptor Annabel Stanley, foreground, shows participants how to make coiled bumblebee ‘pots’ during a recent Pollinator Pasture event. A series of events, organized by UBC Okanagan’s Border Free Bees and the City of Kelowna’s Public Art Pollinator project, will give people the opportunity to create art, learn about pollinators and enjoy the great outdoors. There are six free, drop-in events at the Pollinator Pasture at the Brent’s Grist Mill Heritage Park running over six consecutive days. The first session on Tuesday, Aug. 29 is held in conjunction with a Parks Alive event—music and displays from the Kelowna Museum Society will be on site. All remaining events feature guest artists, artisans and musicians. Participants can also learn about the Border Free Bees research project that links art with wild bee conservation. In collaboration with the Border Free Bees research project and EartHand Gleaners Society, this series of events is presented by the University of British Columbia’s Okanagan campus in partnership with Emily Carr University of Art + Design, the Kelowna Museum Society, and Parks Alive at the City of Kelowna. Everyone is welcome but people must be prepared for uneven ground and exposure to sun and heat. Please bring drinking water, picnics and appropriate sun protection. These outdoor events are open-air and weather dependent, and there is no water access or washroom on site. If in doubt, call 778-840-8911. Tuesday, Aug. 29 from 6 to 8 p.m.
Wednesday, Aug. 30 from 6 to 8 p.m. Harvest, process and learn about wild grasses. Thursday, Aug. 31 from 6 to 8 p.m. Harvest, process and create cordage out of stinging nettle. Saturday, Sept. 2 from 9:30 a.m. to 12:30 p.m.
Sunday, Sept. 3 from 9:30 a.m. to 12:30 p.m.
Monday, Sept. 4 from 10 a.m. to 12:30 p.m.